When you're a college student, extra cash is hard to come by. But when an influx of cash is the result of unused student loan money, you've got to make an informed decision on how to spend it — especially since you'll eventually have to pay it back with interest. Do right by yourself and your wallet with these tips on how create the least amount of financial liability if this windfall comes your way. You shouldn't have many expenses as a college student, but occasionally you may have to foot the bill for something unexpected, like a car repair or co-pay for a medical appointment. Use your extra student loan money to cover these costs. "If anything comes up during the semester, you'll have the funds to cover it," says personal finance expert Jeff Proctor, founder of money-saving resource DollarSprout. "If you're able to hang on to this money year after year, you could graduate with a nice emergency fund set up before heading into the workforce. 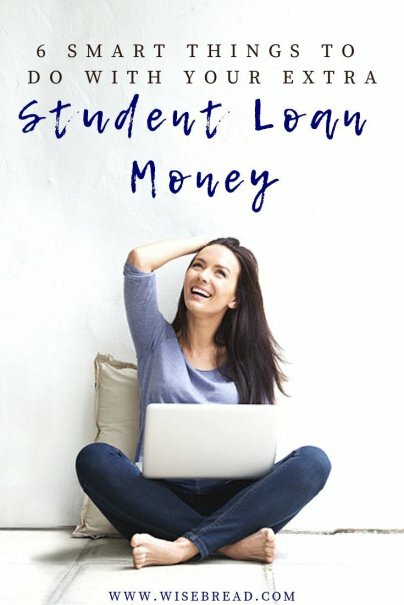 This will come in handy with moving expenses after college, and it will also free up your income for other things, like paying off debt or building your professional wardrobe." If you choose to stash the money away for emergencies, allocate it for that and nothing else. This isn't free money that you should be spending at the bar or on dinners with friends. As tempting as that may be, you will pay for that frivolousness many times over since interest will continue to accrue on the borrowed funds until you pay them back. I wish I told the credit card vultures to keep their plastic when they came calling as soon as I turned 18 so I didn't max them out within months. And without the money to pay the bills until about five years later, this was a mistake that damaged my credit well into my late 20s. "About 60 percent of college students take six years to earn their degree instead of earning it in four years," says Adrian Ridner, CEO and co-founder of Study.com. "Earning affordable college credit through online courses or College Level Examination Program (CLEP) exams can help you not only stay on track to make graduating on time more realistic, but it may even give you the opportunity to graduate early, which will cut down on your educational costs even more." The faster you graduate college, the less you'll need in loan money, and the less you'll pay overall for your education. If you're not paying for your own college education, that extra student loan money isn't yours. So if you receive a check because there's overflow, you ought to hand it over to your parents, grandparents, or whoever's footing the bill so they can reduce their own financial liability. You're not entitled to it, and you shouldn't have it without their permission. You could also return the check for federal student loans to the Department of Education, and the amount will get taken off your loan balance.